This mix with distinct notes of cinnamon and lemon infuses your rum with Creole flavours. This blend of aromatics for flavouring cocktails is gently fruity and sweet. 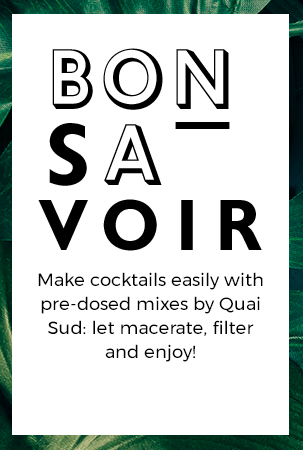 This mix with fruity citrus notes adds a burst of Antilles flavour to your cocktails. A blend of aromatics for cocktails with lovely citrus notes. Use this mix for deliciously fruity daiquiris with notes of strawberry and lemon. This mix for flavouring cocktails made with papaya, raspberry and rose is deliciously sweet. A ready-to-mix blend of aromatics for delicious banana and coconut cocktails. This blend of aromatics makes mojitos with delicious natural lime and mint flavours. Use this deliciously fruity mix to make your own flavoured vodka cocktails.